Welcome to the Orc Vs. Elf Slot Review. Orc Vs. Elf is a video slot machine that is powered by Real Time Gaming (RTG) software. It was released in 2014 and was one of the first 3D games that Real Time Gaming (RTG) had released. It features five reels with twenty-five pay lines and has a fantasy theme, and it looks like the Lord of the Rings movie inspired the game. 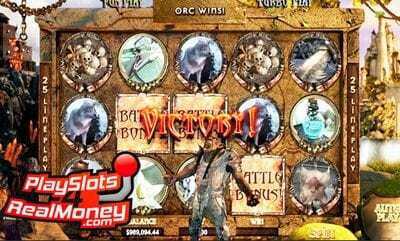 Orc Vs. Elf has scatter wins, free spins, bonus games, wild symbols but does not offer a progressive jackpot. You can play this game for free, real money or with Bitcoin at any of the USA online casinos that are listed on the bottom right-hand side of this page. Before you start to spin the reels and play “Orc Vs Elf” online slots for real money you need to select how much money you want to spend playing the game and select whether you want to be the Orc or the Elf. Once you choose the Orc or the Elf, the American gamblers can bet as little as one penny per spin, or they can wager as much as one hundred twenty-five dollars per spin. Overall the game is fun to play and has a nice 3D introduction explaining the storyline. Above all, my favorite feature in this game is the Battle Bonus. Trigger this free spins round when you land three or more of the elf and orc shields. Do you like multipliers? Trigger the battle bonus round and multiply your winnings by twenty times! Also, the storyline in this round allows you to battle the champion at the end, just like a video game. Keep your eyes peeled for the Orc icon, as that is the expanding wild symbol in the game. This icon only appears on the first reel and will substitute for all of the other icons except the Elf, which appears on the fifth reel. If you are playing the game as the Elf, then the Elf is the expanding wild symbol, and he will replace all of the other symbols except the Orc shield. When you land three or more of the Orc, or the Elf Shield scatter icons, you will trigger the battle the player bonus round. In this round, there is a feature trail where 7 of the Orc or the Elf symbols lead you to the Fortress of Orc home. You have the choice if you want to accept or reject this feature and continue playing the regular game. If you decide to dismiss the feature, it will reset the feature trail. Overall we do not think that this is the best online slots game that Real Time Gaming has in their inventory, but it is fun to play and has some great wins. The Orc Vs. Elf slot machine was one of the first three-dimensional slots that Realtime Gaming produced. In fact, they didn’t just produce the game, the did a great job with an incredible storyline, big wins, and cool characters. When you spin the reels, you will notice a lot of Orcs or the Elves. After you score some of them, you will be able to win prizes when you score the Orc and Elf themed icons. Orcholme on one side and Elveros frame this five reel video slot machine with twenty-five pay lines. While there is no progressive jackpot, you can win nice prizes while enjoying the cool features from Realtime Gaming. Also, if you score five of the crossbows or the swords, you will win 125 coins. However, you can win 500 coins if you land 5 potions or skull symbols. Lastly, one thousand coins go to the person that lands five of the Orcholme or Elveros images.Last updated March 10, 2019.